Here's a rare sight: four out of the ten Nimitz-class aircraft carriers—the largest warships ever built—plus an Enterprise-class carrier docked together. 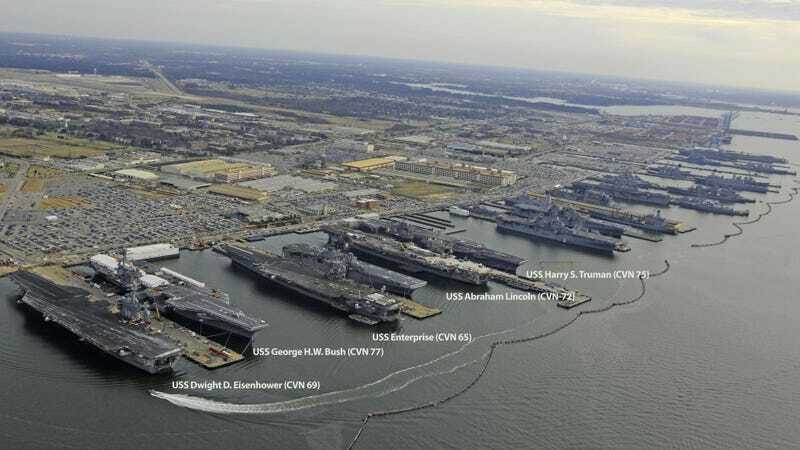 They are resting at Naval Station Norfolk, Virginia, which coincidentally is the largest naval base in the world. Look at all that engineering and firepower. And it's only half of the Nimitz fleet! The other ships are not too shabby either, including six amphibious ships—the other "smaller" carriers on the photo, capable of deploying US Marines, Harriers, helicopters and other vehicles for amphibious assaults. These are larger than what other countries call aircraft carrier. I think I see the USS Iwo Jima and the USS Bataan, but please correct me if I'm wrong, sailors.